1992 was a momentous year for me. I came up with Grease Monkey in the spring, started drawing the first six chapters in the summer, and completely changed the path of my life in the winter. The big event that caused this was a move across the country (from snowy Michigan to sunny California) to work full time for Malibu Comics, for whom I had done most of my freelancing for the previous three years. I saw it as a stepping stone into the world of film and/or animation, and the first chance to enter that world found its way to me in the form of the flyer shown at right. 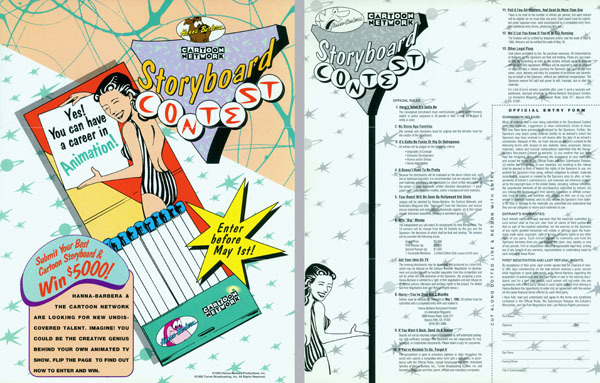 Hanna Barbera Studio still existed then, was running Cartoon Network, and opened up a contest for anyone to submit a storyboard of their own to pitch an animated show. 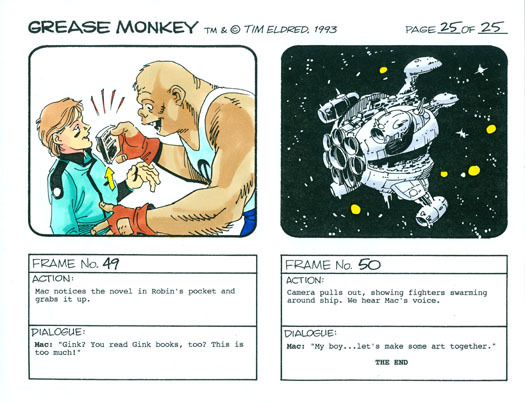 I was ready, willing, and able to do this with Grease Monkey as my subject, so I drew up my own storyboard template and got to work adapting Episode 1. The limit they placed on it was 50 panels or less, so the trick was to squeeze it all in by May 1, 1993. One of my new friends at Malibu, artist Albert Deschesne, agreed to colorize it for me, which marked the first time the characters moved beyond black and white. Albert did a bang-up job, and set the “tone” (hardy har har) for all color works that followed. Below is the entire storyboard as it was submitted. Afterward comes the butal evaluation. Of course, my entry into this storyboard contest didn’t win anything. All I got for my effort was the judge’s ballot shown at left. I did make it as far as semi-finalist, and the marks were surprisingly high. 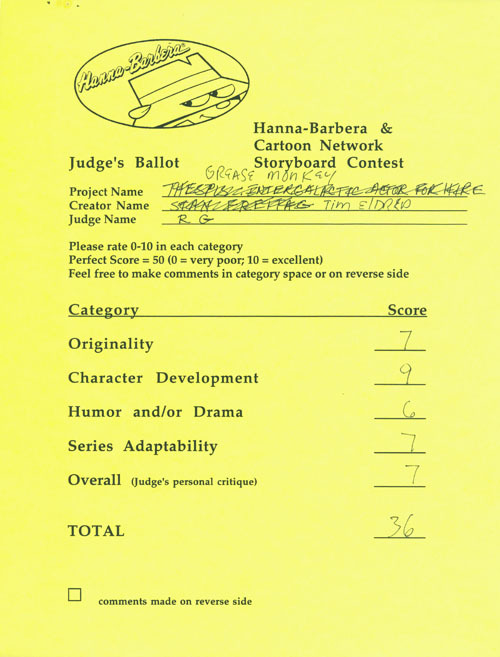 I say this because I personally would have scored it lower, especially in the “series adaptability” category. I really had no idea what I was doing with this project. I didn’t even know what a proper storyboard template looked like. My goal was simply to get Grease Monkey seen by a studio. I had never done a storyboard before, and was utterly ignorant of the mechanics involved. My actual animation career began three years later, and every time I’ve gone back to look at these “boards” since then, I’m more astonished by how clueless I truly was. First of all, the attempt to simply cram it all into 50 panels was the wrong approach. That limit was set to govern screen time, and 50 panels equates less than a minute. Second, if a cartoon was made exactly as these boards suggest, it would be pretty boring. There isn’t enough room in the frames for anyone to move around, the environments are unclear, and the shots would linger far too long. Basically, as a storyboard it makes a decent comic strip. Though it’s easy for all of us to be embarrassed when we find out how little we knew way back when, recognizing the follies of your past is a mark of advancement. The mere fact that you can look back and see how awful your work used to be means you’ve improved. Now that animation has been my day job for almost 20 years, It’s actually refreshing to dig this project out once in a while. When I spot yet another level of boneheaded incompetence in it, I can be confident that those mistakes are even farther in the past.